Jumo has introduced the new plastoSens T04 plastic temperature probe, which can measure the temperature in injection moulding processes by simply being placed on a pipe. To measure the temperature, different platinum thin film sensors can be used in a two-wire circuit, depending on the requirements – maximum measurement temperature is 180°C. The Jumo plastoSens T04 probe with protection type IP65 is made entirely from thermally conductive plastic, which not only ensures fast response times, but also guarantees reproducible measurements. 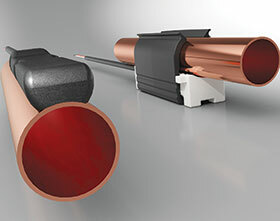 A wide range of variants with different diameters ensures that the probes can be optimally adapted to suit the pipe diameter, regardless of whether the pipe is made of copper, steel or plastic. As a further benefit, the device is fastened externally which means the flow in the pipe remains unchanged. The T04 enables temperature measurement on tubes as small as 8 mm, and the entire temperature probe installation can be given a seal to identify tampering. The accessories, including a shielding shell and fastening clip, ensure that the probe can be mounted quickly and easily without the need for additional tools. Environmental influences such as drafts, which can falsify results, are also minimised.